Picking just the right eCommerce theme isn’t difficult when you have the best of the bunch to choose from, as is the case here. Whether your end product will be a success however, is up to you. What Should You Consider When Choosing Your Store’s Look? Follow these simple rules, and you should do well. Decide What to Invest in a Homepage Banner – A visually dynamic banner can certainly attract attention, but if it is poorly designed, it could have the opposite effect. Relaxing and inviting beats loud and flashy every time. Think About How to Display Your Products – When you are browsing a theme, replacing demo product images with your own might seem easy; but you need to be make sure they fit in nicely with the theme’s style. Think Mobile First – Roughly half of your potential customers will be shopping from mobile devices. Make shopping easy for them. Look for Lightweight, Fast Themes – A lightweight, fast theme, like any of the following, will be easier to work with, and produce fast page-loading websites. XStore is regarded as one of the easiest eCommerce themes in today’s market to work with. Browse through this theme’s 26 (and counting) demos, and you’ll see that XStore’s authors have taken Krug’s first law of usability to heart. The demos may have a familiar look, but the that is simply to help you make your online shop professional looking and trustworthy, and make shopping easy for your visitors. Hover over a demo and see the different ways in which you can make your online shop ideas spring to life, how to set up your inner pages, and how you can use special effects to engage your visitors. XStore is 100% WooCommerce compatible, it’s RTL Ready, and it is fully compatible with Visual Composer. Theme Options is a standout feature that gives you all the flexibility you need to create an outstanding online shop. To experience eCommerce design as it should be experienced, you need look no further than this exceptional theme. A video tutorial is included to help you with install and managing settings. Merchandiser is packed with everything you need to set up an awesome online store, but that doesn’t mean it is loaded down with every imaginable feature. Themes like that tend to be cumbersome to use, and are at times slow to respond. Quite the opposite is true with this theme, whose authors look upon simplicity as the ultimate sophistication. Merchandiser is a minimalist theme, and as such, it will give you lightning-fast performance. This theme is powered by WooCommerce, it has been built in accordance with WordPress best practices, it is fast and reliable, it has an extremely easy to use interface, and it has been equipped with a series of premium plugins. As for your users; with Merchandiser, you can offer them better ways to open accounts, explore your shop, make payments, and offer reviews. Store is loaded with features, including a great selection of different layouts, showcase areas for featured products, adjustable sidebar widths, an advanced Nav system, and high-quality animation. 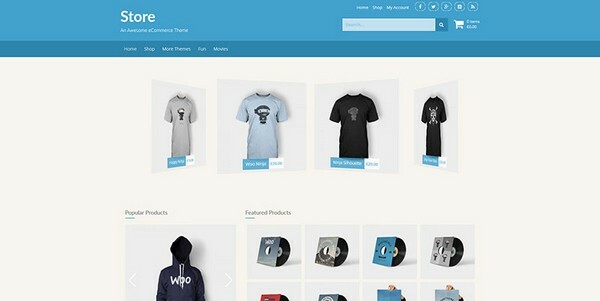 Store is built on the Bootstrap 2 and Font Awesome platforms. As you would expect, this WP theme is 100% responsive, so your online stores will display perfectly on mobiles, tablets, and desktops. Visit the Store website, and check out their demo. The intuitive Divi Builder and Divi’s building-block foundation is a powerful website-building combination. You simply choose among this WP theme’s array of 46 content modules, drag and drop them into place, customize them as needed, and you will have a completed page in minutes. The modules include all the elements and features needed to create your online store, and you can go from start to finish without having to introduce a single line of code. With this premium theme, there are no limits as to how you can arrange and customize design elements to fit your need. KLEO has a host of great things going for it, and it keeps adding to the list. These include demos that you can pick and choose elements from as you build each page, an awesome collection of plugins (currently 24), that now include Sensei for selling online courses, Geo Directory for setting up your own business directory, WooCommerce, Buddy Press, and WordPress SEO. KLEO also features a selection of shortcodes to help you out, so there is no coding required on your part, and should you encounter a problem, their premium class customer support service is there to help. When you’re using Uncode to build you eCommerce site, you’ll be working with concepts. That’s what Uncode’s authors call that others usually refer to as layouts. You’ll quickly find out however why the term concepts makes sense. There are five different categories, Classic, Creative, Portfolio, Blog, and Shop, any one of which can take your web building experience to a whole new level. Uncode’s other secrets include a powerful hierarchical options system, and a super-responsive adaptive images system. This pixel-perfect, flexible system will be a great choice. Merchant is hip; another way for describing a super-responsive, beautifully designed eCommerce theme that is fast, flexible, and an absolute joy to work with. It’s simple to use, with features including the Easy Layout Creator for fast and flexible builds, layouts of stylish product catalogs and portfolios, plenty of color options, and it’s translation ready as well. Merchant is, as you would expect, 100% WooCommerce compatible, and its use of WordPress best practices makes it extremely plugin-friendly. Full documentation, and an active support forum combine to give you great support. A nice thing about this list is that you really can’t make a poor choice. You may however, find a theme that will suit your needs more than the others, but any one of these eCommerce themes will get the job done in spades. Your choice may involve nothing more than choosing between a multipurpose theme, of which there are several, and a theme the specializes in online store-building, of which there are also several. As you begin putting your pages together, remember to keep our tips in mind, so your users don’t have to think their way through your online store.